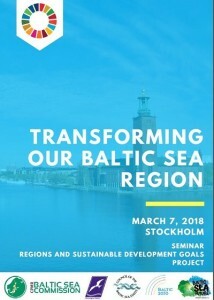 Co-organised by the CPMR Baltic Sea Commission, together with Euroregion Baltic, CBSSS Baltic 2030 and Baltic Sea Future, the event ‘Transforming our Baltic Sea Region’ took place on 7 March in Stockholm. The seminar provided the opportunity for regional politicians and civil servants to discuss and exchange best practices on how the principles of the Baltic 2030 Agenda can be integrated into regional policies. In his opening speech, Gustav Hemming, County Council Commissioner for Regional Planning from Stockholm County Council, stressed the importance of linking regional development with the Sustainable Development Goals (SDGs). In the first part of the seminar, representatives from the local level (the City of Lahti in Finland and the City of Stockholm), the regional level (Region Skåne) and the national level (Sweden) presented actions taken by the public authorities to implement the SDGs into policies. During the seminar, Krista Kampus, Head of Unit of the CBSSS, presented the Baltic 2030 Action Plan which was endorsed by the CBSSS Foreign Ministers in 2017. 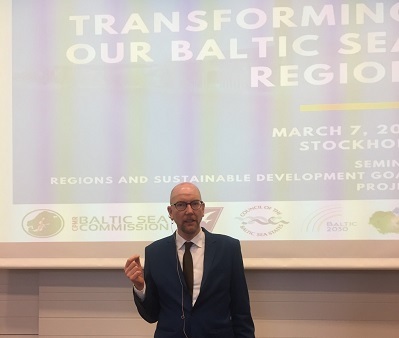 It was followed by a presentation of the results of SDGs implementation in the Baltic Sea Region by Sven Beyersdorff from Nordic Sustainability. The seminar was also marked by the introduction by Alan AtKisson, renowned sustainability consultant, of a method of working with sustainable development composed of five critical steps called the “VISIS tool” (Vision > Indicators > Systems > Innovation > Strategy). This method should help public authorities to integrate the SDGs in policies. 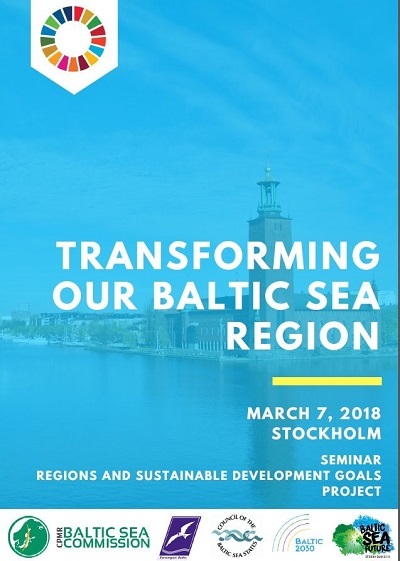 For 2017-2019, the CPMR Baltic Sea Commission has set as a priority the need to enhance capacity and opportunities for member regions to increase their knowledge of the Baltic 2030 Agenda, the SDGs and relate them to their regional development strategies. The Executive Committee has mandated a task force, led by Region Norrbotten, to steer this priority area. The CPMR Baltic Sea Commission works closely with ERB on a project funded by the Swedish Institute. The event on 07 May was a project activity. The CPMR Baltic Sea Commission is a member of the CBSS Expert Group on Sustainable Development. Save the date: During the 9th Annual Forum of the EUSBSR in Tallinn on 4-5 June, the CBSS Expert Group will organise a high-level, entitled “EUSBSR post-2020: Defining joint challenges as drivers for change”. For more information, contact the secretariat of the Baltic Sea Commission.